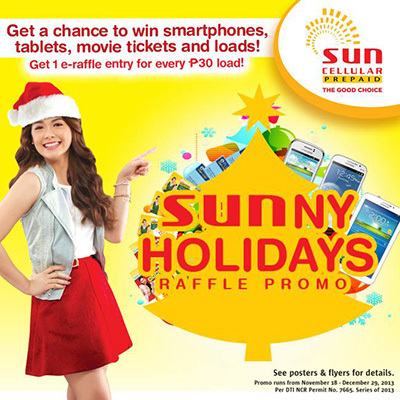 Join the Sun Prepaid SUNNY HOLIDAYS RAFFLE PROMO! by simply loading P30, get one (1) e-raffle entry and a chance to win Samsung Galaxy smartphones and tablets, an SM Cinema movie tickets and lots of FREE mobile loads. Promo runs from November 18, 2013 to December 29, 2013. Join Now! Promo is open to all Sun Cellular Prepaid Subscribers NATIONWIDE. The Subscriber must register before he is eligible to join the raffle promo. Every one-time load of at least P30.00 of any Sun Cellular Prepaid load variant via Xpressload or Call Card entitles the Subscriber to one (1) electronic raffle entry. The number of electronic raffle entries given will be based on Sun Cellular Prepaid load increments of P30.00. Visit Sun Prepaid Facebook NOTE for full details and FB Page for the latest updates.